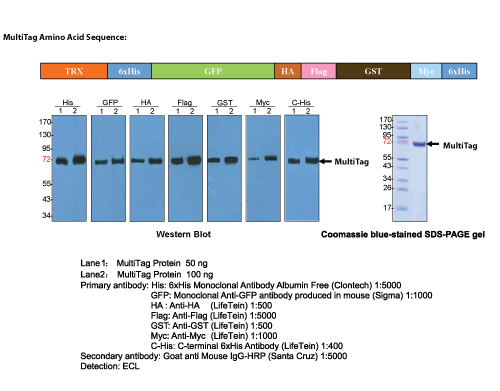 The multi-tag positive loading control protein is used to demonstrate that your Western Blot protocol is efficient and correct and that the antibody recognizes the target protein which may not be present in the experimental samples. Loading such protein into your positive control lane results in a reliably detectable protein sample. It means all the steps of your Western blot functioned properly, including gel electrophoresis, protein transfer to blotting membrane, membrane blocking and antibody labeling. It also gives you greater confidence that the results in the other lanes are real rather than artifactual. We strongly recommend the use of a positive control protein when setting up a new experiment; this will give you immediate confidence in your Western Blot protocol. When trying to detect low-abundance proteins, it is especially important to know that your Western blot is functioning as expected. If you detect your protein of interest in the control lane, then an absence of the protein in other lanes is probably directly related to its low abundance rather than a faulty step in the blotting protocol. Demonstrate that your protocol is efficient and correct. Perfect positive control protein for your Western blotting. Give you confidence in your Western blot protocol. Can be used for immuno-precipitation, affinity purification, Western blot and dot blot. Epitope tagging is a technique in which a known epitope is fused to a recombinant protein by means of genetic engineering. By choosing an epitope for which an antibody is available, the technique renders it possible to detect proteins for which no antibody is available. This is especially useful for the characterization of newly discovered proteins and proteins of low immunogenicity. By selection of the appropriate epitope and antibody, it is possible to find a combination with properties suitable to the desired experimental application, such as Western blot analysis, immunoprecipitation, immunochemistry, or affinity purification. Store the protein at -20℃ or below. After reconstitution, aliquot and store at -20°C or below. Loading 50-100ng is recommended. For research purpose only.